- Cut the dates on one side, and remove the kernels. Don't cut too much - we'll stuff the dates with cheese, which will melt during cooking, and we don't want this melted cheese to freely escape the dates and spread all around the pan (and burn). - Cut each bacon slice such that it can is sufficient to go around a date, and a bit extra (to stick together). It ended up being about 2/3 of the bacon strips' length for the dates I used. - Pan fry the smaller pieces of bacon. When ready, let them rest on a paper towel for a few minutes - it will absorb some of the fat. Then break them into smaller pieces. - Cut out pieces of brie, mix them with the bacon pieces, and use the mix to stuff the dates. 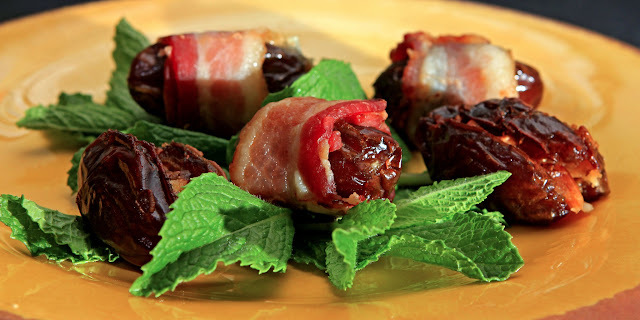 - Wrap the stuffed dates in the longer strips of bacon (one string per date). Start and end the bacon over the whole in the date where we stuffed the cheese. - Place the bacon-wrapped dates in a baking pan, with the cheese mix facing up. We'll try to avoid the cheese melting and falling out. - Preheat the over to 450. When ready, place the baking pan in. Let the stuffed dates cook for about 20-25 minutes (remove from the oven when the bacon is ready). - Some fresh greens can add beautiful color to this dish. I served the recipe over a bed of fresh mint leaves.